The Viles Arboretum in Augusta offers a symposium featuring stone artists. AUGUSTA — Beau Clark watched two artists using diamond saws on large blocks of granite, the smaller of the two 1,000 pounds in size. And as the 10-year-old shook his head, two other classmates at Richmond Middle School stood with their mouths open. Three years ago the Viles Arboretum had 16 stone sculptures by Maine artists installed along an art trail that stretches nearly a half-mile across the 224-acre preserve. 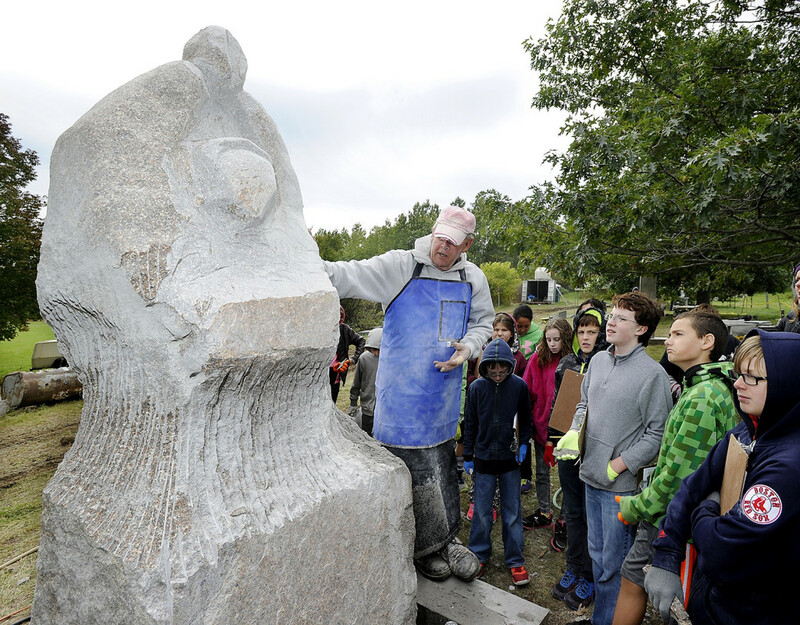 For the past two years, Maine artists have come to the arboretum to sculpt large pieces made from granite while school children watched and learned. Last year, the students came from schools in the Augusta area. 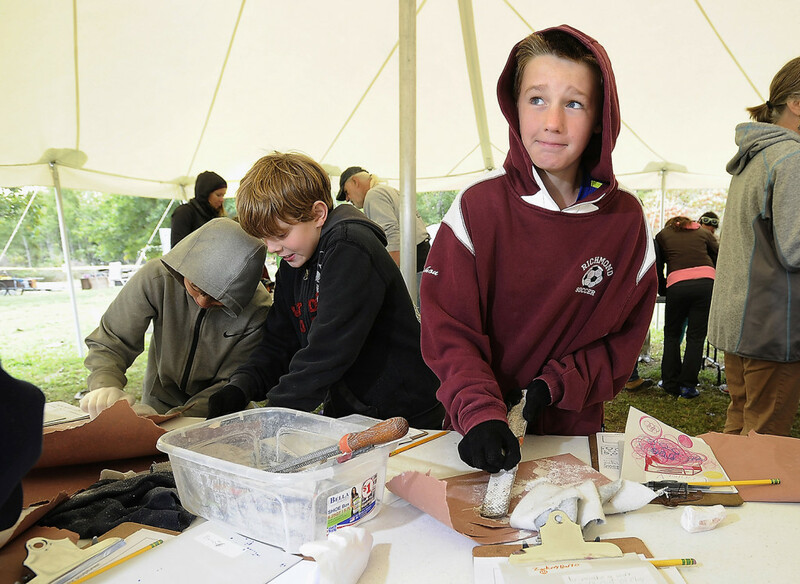 This year, grants from the Maine Arts Commission and the Maine Stone Workers Guild helped make possible a five-day symposium that brought children from schools as far away as Trenton to the east and Kennebunkport to the south. 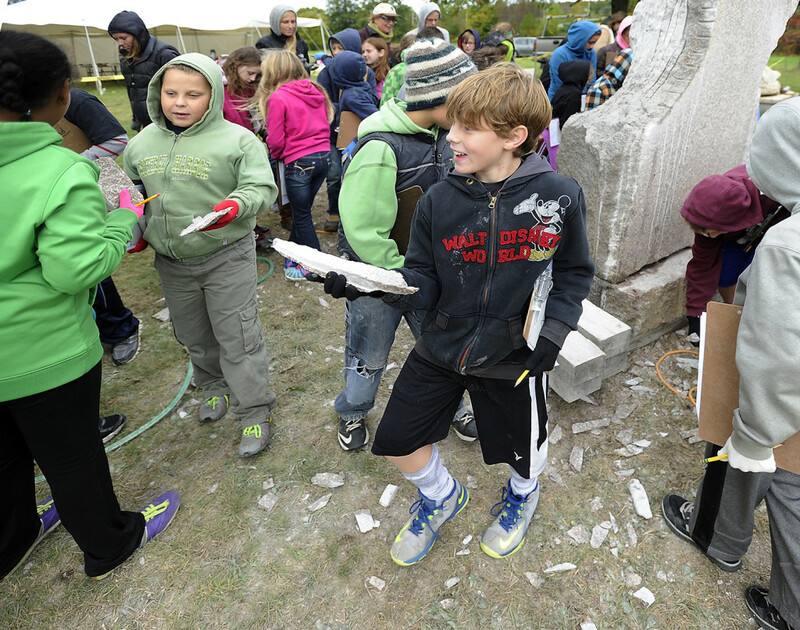 The students, ranging from grade schoolers to high schoolers, watched 13 professional artists cut, saw and shape blocks of stone – working in conditions that included cold, wind and even a downpour. The students received hands-on instruction from artists Anne Alexander of Windham and Gerry Goff of Mount Vernon. Seeing the artists work outside was an eye-opening experience for many of them. “For the children, they must think all artists work inside stuck in a studio. For them this is probably a discovery. It’s unconventional,” said artist Lise Becu, 58, of Tenants Harbor. An artist of 40 years, Becu said the Maine coast provides inspiration and subject matter. “This piece has a peacock above and mother and child (below),” she said, looking up at her sculpture. “The peacock feathers around it speak of protection; the eyes of the feathers are watching. Just as the mother is watching the child. Alexander said stone artists need to work outside because of the stone dust. However, while she works in different mediums, she prefers to work in nature, and to show her art outside. While several stone artists worked under trees throughout the symposium, five groups of students worked under a large tent. But the tent was located in a wind-swept field that was cold and damp. 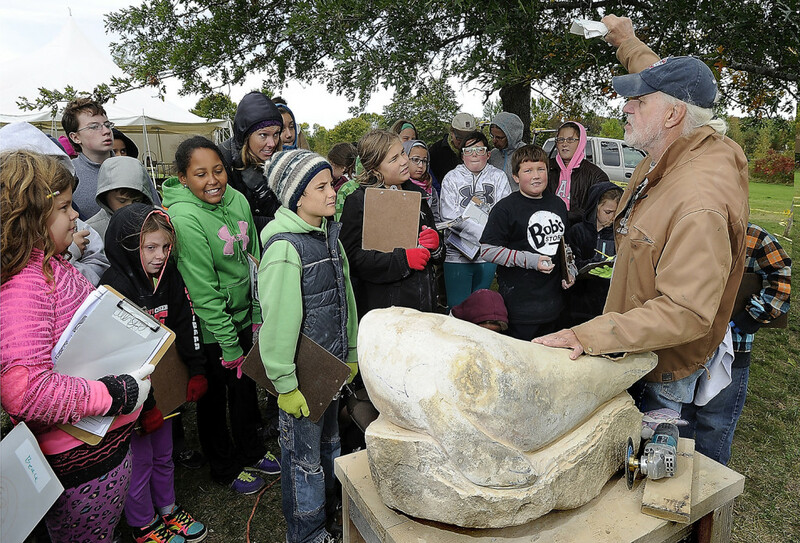 The conditions didn’t seem to faze the 160 students who were taught to chisel alabaster. “Maybe a few lost focus, but not many,” Alexander said. Hoff said when students are out of a classroom, in a wild, ever-changing environment, there is more mental stimulation, and they focus better. “I think they forget about other things when they are out of their element. I think they feel like real artists,” Hoff said. As for Clark, the Richmond fifth-grader, seeing sculpture displayed in a field was enough to make him want to find more outdoor art. “I want to come back in the winter when the leaves have fallen and there is snow out, to see the art then,” Clark said.